THE Richmond is a versatile, creative sort. Eye-catching on the outside, beautiful on the inside, yet down to earth at heart. Earning a boy-scout badge for always being prepared, Richmond has the ability to attune to any situation and has the means to take it on. Open-mindedness is one contributing factor, but a rock-solid foundation is another trait that gives the confidence required to take on any task. Richmond is available with many different suits, whether in Richmond of Portland, Richmond of San Francisco, Richmond of Kansas or Richmond of Virginia. If appearances concern you, rest assured that there are alternate forms available. A small porch greets you from the street. In other guises, this might be the stoop of old that brings you in contact with your neighbors on a warm summer night. The foyer inside is small but open and a bench gives pause to reflect (or remove your boots). The parlor is outfitted with bay windows and a fireplace. Arched openings lead to the dining room and service hallway. The dining room is matched to the parlor with a similar bay window. Further on down is the sizeable kitchen with access to the grilling porch, view deck, or woodshed. Off the service hallway is a small powder room and a flex space. Such space could be an office, playspace, or guest bedroom in a pinch. For the basement version the flex room loses a few feet. Added built in bookshelves turn the flex room into a reading space or quiet retreat. 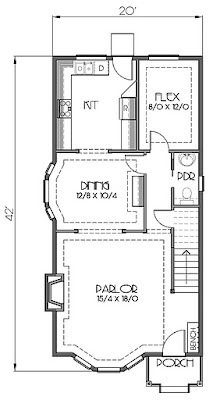 The second floor contains three bedrooms and two baths. The master suite is outfitted with a modest bath and walk in closet. 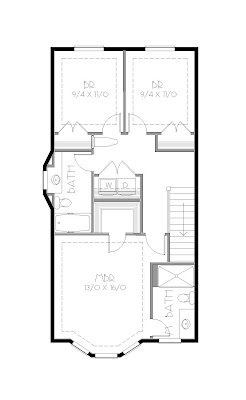 Two other bedrooms share a bath. A word about the hall bath; by using the bay from the dining room downstairs, Richmond again shows his readiness by offering more floor space in an otherwise standard situation. As for open-mindedness, who says that a mirror must always be behind the vanity? The small laundry closet upstairs is made bigger by utilizing the space in the landing. A fold-out ironing board and floor space for sorting laundry and folding clothes helps to alleviate any tension and crampedness that might otherwise be felt.